Whew... it's been a while. I completely overscheduled myself this summer, so not only have I not had any crafting time, but I haven't had any ideas for a while. It was a little worrisome, because I have all this crafting STUFF, and it's seems wasteful not to be able to use it. I love batik- it's so beautiful without being overly patterned. All of these butterflies came from the same strip of fabric. I didn't have any spray adhesive to back my fabric, so I used Heat n Bond, die cut several butterflies, and ironed them together so there is some bulk there. I then ran them through my sewing machine chain style and it kind of looks like the sewing is antennae. 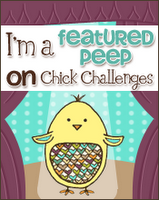 They're kind of flat, so I embossed the background and added jewels to the front. I wish I could've figure out how to get the sentiment on the front. I stamped it inside, instead. How pretty! 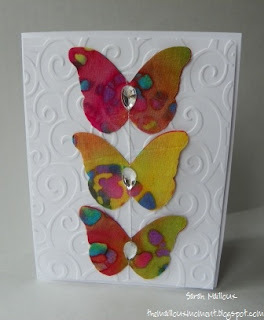 I love all the color on the butterflies against the white embossed card base! Thanks for sharing! This is just gorgeous! I love the bold prints in contrast to the white base. Beautiful card!